March 4, 2015 (La Mesa)—When it comes time to choose your engagement and wedding rings, start by checking Yelp to find a reputable jeweler. Call and ask if they have a goldsmith on staff. Ask if they make their own original jewelry. (Do you really want one of 10,000 made in Bangkok?) Clerks at a store that only sell jewelry, not design the products, may have limited knowledge of how they are made. If possible, purchase American-made jewelry. Before selecting a piece of jewelry, decide on your budget. Do you want a lot of mediocre stones, or a smaller stone of fine quality? When you can look at a piece of jewelry, examine it carefully. It should be finished inside and out. Feel the piece to make sure that t here are no sharp areas. If you want a halo or other Diamond-encrusted design, make certain that the small Diamonds are set in a recessed manner. They will stay in longer. Are the gemstones bright? If there are multiple gems, are they set at the same level and oriented in the same direction? The labor (finishing), weight of metal, carat weight of gemstones and quality of gemstones will factor into the price. Gemstones’ prices go up exponentially with carat weight. A one carat will often be three times the price of a half carat. Smaller stones are more commonly found than larger stones. Remember, if it seems too good to be true, it probably is. If you are looking for white gold, ask the clerk if it’s been Rhodium plated. Rhodium is a platinum-group-metal (PGM) and is hard and white. It’s commo nly used to cover-up unattractive yellowish white golds. Annual maintenance costs for you, the consumer, could be $60 or more as the plating will wear off. White golds that do not require plating are available, but are not easy to find. 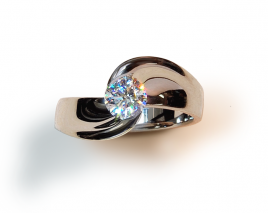 Platinum or Palladium are available, but are not as hard as white gold and consequently do not hold a shine very long. 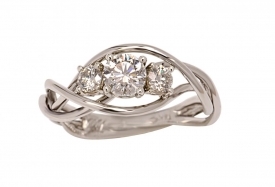 If you’ve got a center stone, four prongs are preferable to six. Clerks will tell you that six are more secure. As a Master goldsmith who has also repaired jewelry for over forty years, I can assure you that six prong settings consistently have more issues than four prong settings. The reason for this is simple: the prongs on six prong settings are thinner (meaning weaker) than prongs on four prong settings. Some couples want something completely unique for their one-of-a-kind love. One advantage of a unique design is that you can pick the quality of the gemstones that are incorporated into your jewelry. Custom work costs a bit more as there is more labor. There are three ways to go about that. Most stores offer computer-assisted-design (CAD). This consists of creating a piece of virtual jewelry, then 3D printing it, casting, finishing and stone-setting, most of which is outsourced. These tend to be less outside-the-box designs than the other two ways to make jewelry. You could have a goldsmith carve a wax for you, so you can see a 3D representation of the design, then casting, finishing, and stone-setting follow, asssuring an original. 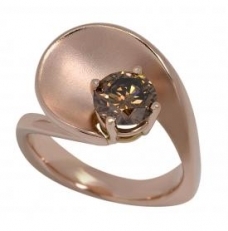 The third way is to have a goldsmith fabricate the jewelry. You get to see a drawing or CAD image, but not the process. The goldsmith forms the precious metals and brazes them together, then finishes and sets the stones, insuring that your piece is unique. Ask the clerk is their jewelry guaranteed? If you have to pay extra for a warranty, you’re at the wrong place. A quality-minded manufacturer will stand behind his or her product. Finally, get something quality and within your budget. You have to live with your purchase. Don’t let your emotions cloud your judgment and end up with something you’ll regret. Get something you can build on for future anniversaries.